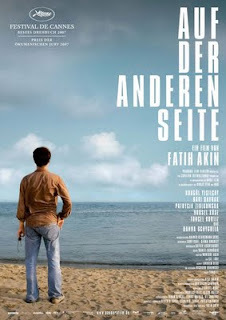 This essay examines the ways Fatih Akin’s Im Juli (2000) and Auf der Anderen Seite (2007) (The Edge of Heaven) either challenge or reinforce stereotypes of Turkish males and females in Germany. Both films, through the characters Melek and Ayten, defy Turkish female stereotypes. Going further, Auf der Anderen Seite appreciates German-Turkish hybridity within the Turkish community while also recognising that certain stereotypes may be close to reality. Meanwhile, Im Juli’s Issa and Auf der Anderen Seite’s Ali are characters whose natures remain somewhat ambiguous at certain stages of their film’s narrative. This essay posits that this ambiguity is a voluntary act on the part of the director and serves to highlight the danger of stereotyping and of making judgments at face value. However, certain stereotypes are in fact reinforced by Auf der Anderen Seite. The film employs contrasts between Turkey and Germany to inflect negative attributes onto the Turkish community. 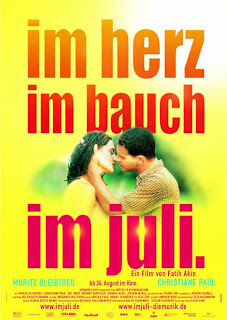 Im Juli offers similar contrasts but this time, it is to suggest new clichés that favour Turkish males over German males. Im Juli’s Melek defies stereotypical images of submissive Turkish females who like Yaman in 40m2 Deutschland (1986) live oppressed by the male patriarchy and secluded from the outside world. Melek, is depicted as a highly independent, mobile woman who while travelling in modern clothing, is at ease with roaming German streets by night. She accepts Daniel’s hospitality without fear of her virtue and the implication is that she is sexually free. Far from being a powerless female figure vis-a-vis Turkish males, Melek is the key to liberating her brother Issa from his police detainment. It is she who delivers her uncle’s birth certificate to the Turkish authorities proving Issa’s case. The narrative therefore represents Melek as an agent of change and as a strong figure on which her male sibling can count upon. However that is not to say that stereotypes of ‘the other’ do not inflect on Melek’s portrayal. Back in Germany, close ups on her moonlit face as she interprets a melodious tune in a foreign tongue evoke exoticism and mystery. Her song’s rapturous effect on the besotted Daniel recalls Western clichés relating to the sensuality and forbidden allure of Middle Eastern women (Valassopoulos 140). Auf der Anderen Seite's Ayten is also depicted as liberated female. Far from being secluded and controlled, she is physically mobile in the outside world, vocal in her political opinions and aware of her rights. The kitchen scene where Ayten is strongly vocal of her political ideologies could, in Göktürk’s terms, serve as an example of how “modern cinema subordinates stereotypical representations of the migrant as downtrodden and speechless victim” (2002 203). Since Ayten’s sexual relationship with Charlotte comes at a time when lesbianism themes have long entered mainstream German cinema (Women German Yearbook 53), the subsequent relationship between a Turkish and German woman therefore evokes the normalisation of multi-cultural engagements. The intense closeness between the two females alludes to the possibility of bridging differences between Turkish and German culture and is a suggestion that perhaps cultural hybridity has itself entered mainstream. By choosing to evade the headscarf in both films, except at Yater’s funeral where several women’s head appear covered, Fatih Akin further opposes common expectations of Turkish females. For many Germans, the headscarf symbolises the “quintessential instantiation of Turkish patriarchal repression and objectification of women” (Mandel 305). In both films, none of Akin’s lead females wear a headscarf. However despite his liberal representations of Turkish females, Akin does not eschew the realities that some Turkish women may continue to experience. One Auf der Anderen Seite scene sees two disapproving, dogmatic Turks hassle Yater in the tram. Their insistence that Yater “Repent” confirms expectations of Turkish male patriarchy and religious dogmatism. They threaten to harm Yater if she does not leave her sinful job while also alluding to her lack of head cover. This passage implies that Yater is suffering the consequences of having provoked the established Turkish repressive patriarchy. Auf der Anderen Seite therefore concedes that cliches relating to women’s status are justified in at least some Turkish communities in Germany. Auf der Anderen Seite uses a complex representation of Ali to both defy and reinforce certain stereotypes about Turkish males in Germany. While his well integrated son, Nejat, embodies cultural hybridity through his respectable professor status, his fluency in two languages and his ability to exist successfully both in Germany and Turkey, Ali remains culturally ambiguous until his demise. To begin, Ali’s initial attitude towards Yater contradicts patriarchal expectations of Turkish male figures. Aware of Yater’s profession, Ali does not scorn her like the other males she meets in the tram. Instead, he welcomes her home offering an arrangement for their mutual benefit. During a dinner with his son, he forbids Yater to take care of kitchen duties, implying that he does not cast her in the dutiful role of household maid. However, following his medical diagnosis and illness, Ali becomes as tyrannical as other cinematic Turkish male cinema figures (Göktürk, 2000 251). He brutally orders a beer from Yater and complains about her cooking. His unfounded jealousy of Yater and his son, together with his drunkeness contribute to his reckless temper so that when Yater threatens to leave and attacks him, he retaliates with enough violence to cause her death. This unfortunately achieves Ali’s recasting as the violent, oppressive patriarch that had so far eluded audiences and unfortunately reinforces expectations of Turkish male figures in Germany. Nevertheless Auf der Anderen Seite raises the question of whether Ali’s behaviour can be attributed to character and origin or rather, whether it should be viewed with compassion given his recent medical situation. On a wider level then, the film warns of approaching clichés with caution since we never know the exact details behind a person’s behaviour. A further example of Akin’s theme that appearances can be deceiving is in the representation of Issa. In Im Juli, Akin plays with audience expectations, only revealing the true nature of Issa’s character at the end of the narrative. Initially, Issa could be regarded as a dangerous, aggressive and rude Turkish male. His seemingly violent, careless nature is revealed as he runs over Daniel with his car and gesticulates madly behind the steering wheel. It may also be the director’s intention that when Issa’s car boot is opened and a corpse is revealed, that the audience would readily assume that Issa is a murderer. However as the narrative unfolds, we learn that Issa is not only family oriented and dutiful to his naturally deceased uncle but had reason enough to be anxious. Issa also cares enough for Daniel to help him escape a Turkish prison. By subverting audience expectations of Issa, Akin achieves a powerful social tool for persuading audiences to avoid stereotyping until more details about a person’s true nature are revealed. One way Auf der Anderen Seite does endorse stereotypes of Turkish communities is by representing their place of origin, that is, Turkey, as a dangerous and lawless space compared to Germany. This representation is then projected onto the Turkish population serving to reinforce stereotypes of a backward, violent and politically unstable ‘other’. Firstly, the film offers a contrast between the exemplary hospitality extended to Ayten during her sojourn in Germany and the way Charlotte, on the other hand, is robbed and murdered in the streets of Istanbul. In Istanbul, we watch Lotte’s purse get snatched by child thieves in a deserted street and follow her frantic course through unsafe passage ways and narrow alleys until she is murdered by one of her drug-influenced muggers. This passage, together with the political peril in which Lotte was enmeshed by retrieving Ayten’s gun at the onset, conveys the danger of the ‘other’ country. Istanbul is represented as unsafe for Germans, a reflection of its population which presumably remains backward and in need of reform. In certain ways, this reform arises at the benevolent initiative of Lotte’s mother who offers to pay for all of Ayten’s judicial fees and contributes to Ayten’s repentance and subsequent freedom. The narrative therefore upholds notions that the German population is more stable and righteous. It also resembles “hypocritical narratives of rescue, liberation and Westernisation” (Göktürk, 2002 66). Albeit Ayten is not liberated from the oppressive patriarchy but rather from her fanatical political involvement. Nevertheless, Lotte’s mother recalls Göktürk’s suggestion that “empathy with the victims of a violent ‘other’ culture primarily serves the purpose of self-confirmation” (2002 251). To conclude on a more light hearted note, a different reading of Auf der Anderen Seite would imply that Lotte dies in Istanbul because she is not as street smart as Ayten. This reading would attribute courage, cunning and practicality to Turkish characters, creating perhaps another cliché. As this reading would have it, the wits of Turkish males and females are supposedly sharpened by their experience in a society that can be envisaged as either economically or socially disadvantaged compared to Germany. This same new cliché resurfaces in Im Juli. On the one hand, the Turk, Issa has a grand devious plan and the courage to carry a corpse in his car across the border. Meanwhile, the German, Daniel, is a well groomed intellectual and a low risk individual who would rather opt for the shortest, safest route to Istanbul. In terms of risk-taking and survival, the two men are represented as binary opposites with Issa being the more cunning of the two. When Issa invites Daniel out of his cell, the male Turk is again portrayed as more street smart than the German who is unaware that he could easily escape through the open door until advised. Auf der Anderen Seite. Dir. Fatih Akin. Madman Entertainment, 2007. 40m2 Deutschland. Dir. Tevfik Baser. Studio Hamburg Filmproduktion, 1986. Transnational Cinema”. Spaces in European Cinema. Ed. Myrto Konstantarakos. Bristol, UK: Intellect Books, 2000. Göktürk, Deniz, “Beyond Paternalism: Turkish German Traffic in Cinema.” The German Cinema Book. Eds. Tim Bergfelder, Erica Carter and Deniz Göktürk. London: BFI, 2002. Im Juli. Dir. Fatih Akin. Senator Film, 2000. Mandel, Ruth. Cosmopolitan Anxieties: Turkish Challenges to Citizenship and Belonging in Germany. Durham, NC: Duke University Press, 2008. Valassopoulos, Anastasia. Contemporary Arab Women Writers: Cultural Expression in Context. London, UK: Routledge, 2007. Women in German Yearbook, Volume 18. Eds. Ruth-Ellen B. Joeres and Patricia Herminghouse. Lincoln, NE: University of Nebreska Press, 2003. I would like to quote this article in my bachelor thesis but I would need to use your real name. Is that possible? Was this article by any chance published in any journal? Thank you for your help and for publishing this inspiring article online! Thank you very much for your feedback. I am very pleased you could find inspiration from this article. This article has only ever been published on this blog so you are very welcome to quote from Les Nuits Masquées as a web source for your thesis. You can use "Laura" as the author's name in your references. All the best. Hey There, really great article, im currently doing my dissertation for University on Identity in Turkish German Cinema, would love to use you as a reference too. What is your full name sorry to ask, if you dont want to post on here could we speak over an email? would be great if you had any information you thought that would be of use to me. Thank you very much for your feedback. Your dissertation sounds like a wonderful topic. You are welcome to use me as a reference if it helps. My full name is Laura Rahme. I have unveiled Les Nuits Masquees recently after launching my new site so I am happy for you to use this name. I am also writing on this topic (identity in Turkish-German cinema). Ben, could you please let me know where do you study?